Readers have asked . . .
Q: A lot of readers assume that you’re from a small Oregon town yourself, because Hubbard is so vividly evoked and its characters are so deeply defined by its limitations. But you were born and raised in suburban New York. What’s the deal with that? A: It’s true that my background, up until my late twenties, was largely urban. I grew up in Upper Nyack, a suburb of New York City, and later lived in Honolulu and Washington, D.C. But in 1984 I moved to Newport, Oregon, then a coastal town of just under 9,000, and everything changed. My first job interview—for a secretarial position with the electrical utility serving the central Oregon coast—ended with a stern lecture about the fact that big-city, East Coast ways would not be tolerated here. It was clear that I had two choices: I could maintain my urban identity and spend a lot of time alone and misunderstood, or I could pipe down, listen hard, and learn about a way of life that was completely new to me. It’s probably no surprise that my survival instincts led me to choose the latter. On those terms, I was befriended by some extraordinary teachers, skilled storytellers, and sure-footed guides to the insular culture of coastal Oregon. I became an avid solicitor of stories of all kinds, and developed a great respect for the strenuous business of living in a town that offers low-paying jobs, limited educational opportunities, significant isolation, and a whole lot of bad weather. Q: Yes, the weather on the Oregon coast takes on the aspect of a character in the book. Why? A: I think that until you’ve spent nine months in nearly relentless wind and rain, you can’t fully appreciate the effect that such weather has on everything you feel and do. And it’s dynamic weather, where the rain takes many shapes—teeming, drizzling, blowing, pelting, and pouring straight down, to name a few—and storm fronts come through like conquering armies. On any given day, damned near everyone I knew could tell you what flags the U.S. Coast Guard was flying over Yaquina Bay to announce the incoming weather. Here’s the thing: You lived in all of this, you worked in it, drove in it, carried your groceries inside through it, ferried small children and babies through it, and your moods reflected it even when you thought they didn’t. You and the weather become one. So when I began writing Going to Bend, it was only natural to cast the weather in a major role. Much of the action in Going to Bend happens over food preparation. What does soup represent in the lives of Petie and Rose? How is that different than its significance for Nadine and Gordon? Kitchens are also centers for discussion, revelations, and turning points. What key scenes take place in kitchens? As a young man, Schiff meets a redheaded girl at a carnival and, early in the book, vividly remembers the few hours they spent together. Later, he will associate her with Petie. Why? What characteristics and quirks do these characters hold in common—and why does Schiff find them appealing? When Petie is young, she and Paula seek refuge in a gift shop from Old Man’s drinking. When a fragile teacup is broken, the shopkeeper gives it and a matching saucer to Petie. What is the significance of these objects to Petie? Old Man Tyler and Petie live in a camp trailer in the woods behind Hubbard. Later, Jim Christie discovers the trailer and uses it for his own purposes. What role does the trailer play in Petie’s past and in later causing a disastrous rift between her and Rose? Going to Bend explores the different kinds of love that can exist between husbands and wives, fathers and sons, mothers and daughters, and friends. 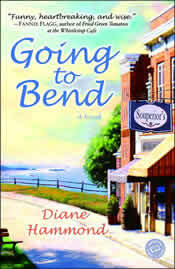 How did those different kinds of love manifest themselves between the characters in Going to Bend? Rose and Gordon become good friends. Why—what do they have in common? In some sense, Going to Bend is a story about the effects of isolation—geographical isolation, psychic isolation, and isolation based on shame and secrecy. What are some examples of isolation and its effect on the characters and on their unfolding stories? In the course of the book there is an unfolding tension between Jim Christie and Carissa that will ultimately have tragic results. What’s really going on between these two characters? Eula Coolbaugh is one of the most important people in Petie’s life. Does Eula’s love for Petie differ from Paula Tyler’s? If so, how? In a childhood visit to Camp Twelve, Petie is badly burned in a fire, and Old Man applies a poultice of ashes. What do these ashes signify, both then and at the book’s end? What role do they play in helping Petie to resolve grief? Eula Coolbaugh may be Going to Bend’s only truly wise character. What wisdom does she impart to Petie that has a lasting effect on her life and decisions? Why? The title Going to Bend has both a metaphorical and literal meaning. What are they, and how do they relate to the book’s main characters? At several key moments in Petie’s life, she buries objects beneath a tree. What are the objects, what do they represent, and why does she bury them? 15. Petie and Schiff, both of whom are married, carry on a clandestine relationship through much of the book. What’s missing in their respective marriages, and how does this play a role in their unfolding relationship? Jim Christie is an inarticulate man with a severely limited ability to communicate his feelings. How does Rose deal with this throughout the book, and what role does it play in the book’s climactic outcome? Work creates tensions throughout the book, and everyone except for Paula Tyler and Eula Coolbaugh has a job. How do the characters regard their respective jobs at the start of the book? At the end? How do they suit each character? Were any of the characters in Going to Bend reminiscent of people you’ve known in your own lives? If so, what were the resemblances? Were there universal truths about people and relationships that were revealed in Going to Bend? If so, what were they, and how might they relate to, say, white-collar people living and working in an urban environment? What do you think will happen to Petie and Rose after the book’s end? What would you like to see happen?